What will happen the next time disaster strikes? South Asia’s disaster response remains incoherent and ad-hoc, as the Bhote Koshi landslide demonstrated last year. A coherent transborder policy must be put in place, argues Srinivas Chokkakula. In spite of the Male Declaration of 2005, and the subsequent SAARC (South Asian Association for Regional Cooperation) comprehensive disaster framework in 2006, disaster response and preparedness in South Asia remains ad-hoc and incoherent. Policy and institutional mechanisms for coping with flood risks over transborder rivers do not inspire confidence in providing the much-needed resilience. In August 2014, Kosi River was in the news in South Asia because of a massive landslide that impounded Bhote Koshi, a tributary of Kosi (or Sapta Koshi as it is known in Nepal). It was feared that it would lead to a repeat of the devastating 2008 floods in Nepal and Bihar, which caused huge loss of life and property due to a breach of the embankment in the upstream of the Kosi barrage. The governments of Nepal and India responded to the Bhote Koshi landslide swiftly. The clinical breaching of the landslide material and subsequent normalising efforts lasted a week or so. The incidence received significant attention; but this ‘unmaking’ of a disaster was not subjected to critical reflection from the perspective of transborder governance. What was done right in 2014, if anything? Was it a consequence of institutional learning from the 2008 floods experience? Or, though laudable, was it just another ad-hoc response that might not be replicable? The landslide occurred in the early hours of 2 August 2014. Within 12 hours the Nepalese Army made its first unsuccessful attempt at breaching the landmass impounding water. News reports said the Nepalese Army alerted Indian authorities, and in less than 24 hours Indian experts were at the ground zero, assisting the Nepalese Army. Within India, the army, the National Disaster Response Force and the Bihar government were fully mobilised to deal with an eventuality of floods, which involved massive evacuations of people in vulnerable areas. This was an unusually swift and effective response. It is no mean achievement after all, in spite of the familiar structural impediments and institutional inefficiencies in transborder coordination. Interestingly, the 2014 event was due to an unexpected natural disaster, whereas in 2008, it was a considerably drawn-out breach of the embankment – with warning signs evident at least a couple of days before it happened. Yet, back in 2008 the agencies responsible could not mobilise the much-needed intervention, at the cost of a large number of lives and huge economic losses. In 2014 however, both governments acted quickly and carefully. 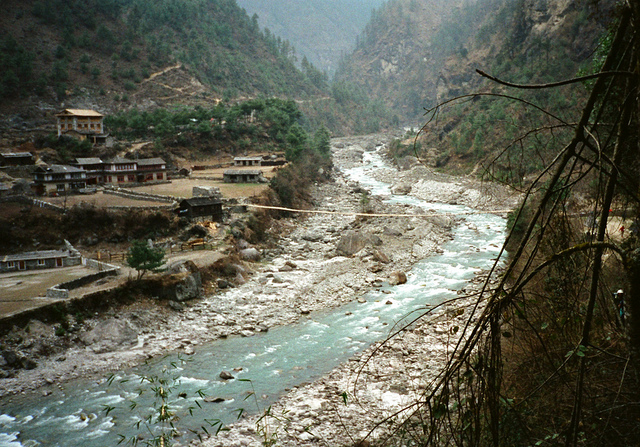 The landslide on Bhote Koshi occurred several kilometres upstream of the Kosi barrage. Under the Kosi Treaty of 1954 (revised in 1966), the management of Kosi barrage was India’s responsibility; but it does not allow India to act on its own beyond the Kosi Barrage project area. But when the Nepal government asked for help, the Indian government sent in their experts and other assistance promptly. This may look like an example of proactive transborder cooperation. However, a closer examination of the incident raises some uneasy questions. First, some hydrological facts: the Bhote Koshi’s contribution to Sapta Koshi’s runoff is less than 5 per cent. The ICIMOD estimated the volume of water impounded in the Bhote Koshi landslide as 7 million cubic metres. Whereas, Kosi’s annual discharge is about 49,000 million cubic metres. The areas in the immediate upstream (due to submergence) and in the downstream (due to floods if the landmass was breached) in Nepal were at risk, but not in India. The stakes for India were really insignificant, especially because the incident occurred more than 180 km upstream of the barrage. If the landmass breached, the water impounded would have negligible impacts at the barrage. The Indian agencies were aware of it, yet it attracted mobilisation from the highest levels, and not limited to merely extending help to Nepal. Further, the mobilisation had no role for the actual transborder coordination institutions in place such as the Joint Committee on Water Resources between India and Nepal, and the Kosi High Level Committee under the Ganga Flood Control Commission in India. The real reasons for such high levels of mobilisation are easy to surmise. At that time, India’s new Prime Minister, Narendra Modi, was making his first and high profile visit to Nepal, and the Indian agencies did not want to leave anything to chance. Clearly, the response was an ad-hoc one. It is also difficult to claim it as a result of institutional learning from the 2008 floods. The Justice Balia Commission set up soon after 2008 floods to probe the reasons, submitted its report only a week before the 2014 incident, in July 2014. This comparing and contrasting of the two particular times allows us to reflect critically about transborder management of floods and other hazards that Kosi is prone to, such as glacial lake bursts and landslides. It required high mobilisation – with absolutely no role for the actual transborder coordination institutions – to respond to the flood risk in 2014, though empty of any actual threat. The ad-hoc nature and the underlying politics of the mobilisation raise questions about its replicability. The high level of mobilisation was necessary to address an important gap in transborder coordination, that of disaster response. These institutions were constituted primarily to manage and maintain barrage and other flood protection works such as the embankments. They were neither mandated nor equipped to respond to the eventuality of floods. This points to the outdated nature of the extant Kosi Treaty 1966 provisions. The Nepal government’s alerting of the possible flood threat and India’s timely response were not obligated, if not prescribed by the Treaty’s scope. Further, the Treaty does not also provide for the critical mechanisms of monitoring threats and risks of the transborder nature posed by events such as the Bhote Koshi landslide. The Kosi Treaty has to be reconsidered to include the necessary transborder coordination protocols, procedures and practices for enabling necessary resilience against disaster risks, or else the next time disaster strikes, the response may not be so quick or so well executed. Dr Srinivas Chokkakula is a Senior Researcher at the Centre for Policy Research, a public policy research think tank based in New Delhi, India.